This article is more for local readers in Malaysia. However the information is useful wherever you are located. 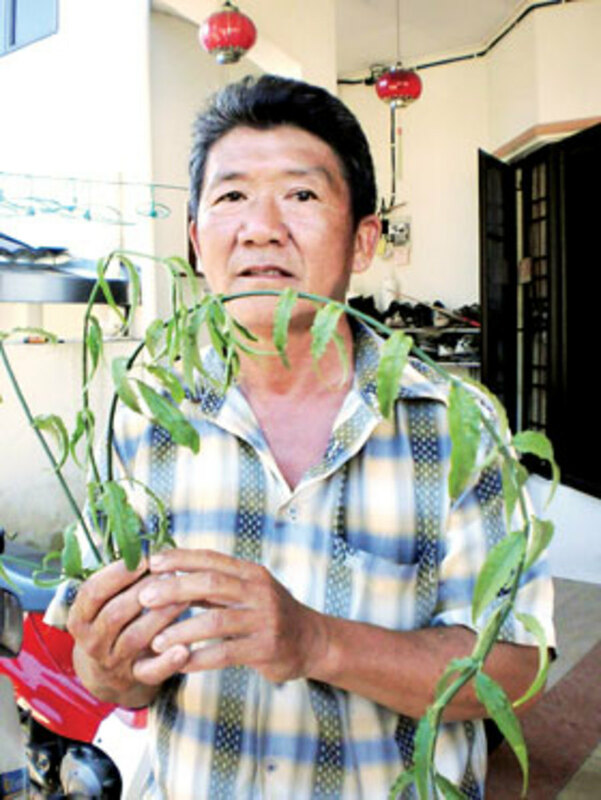 It is about a herb called Sabah snake grass, effective for curing cancer. So this article is aptly titled “herbal cancer treatment”. 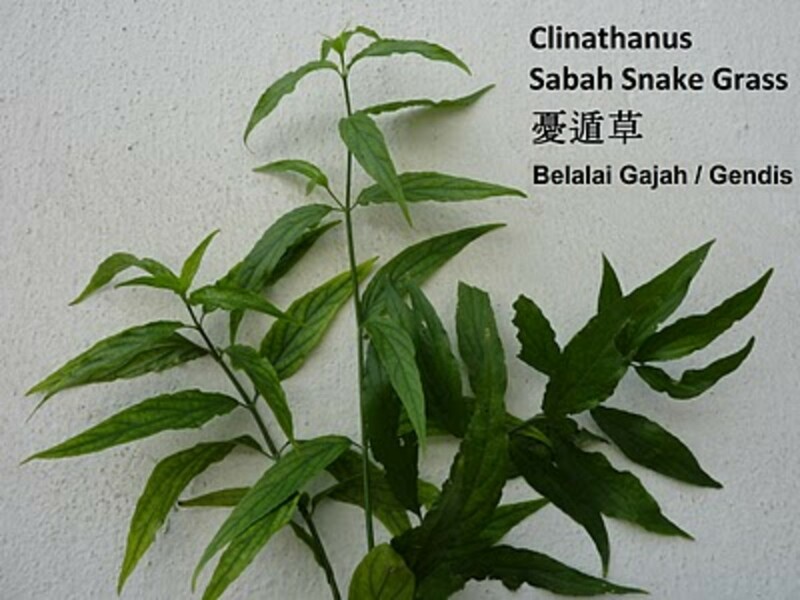 I got this from a viral email and I traced the source as well as other sites that featured this similar subject on this herb locally called "Sabah snake grass". 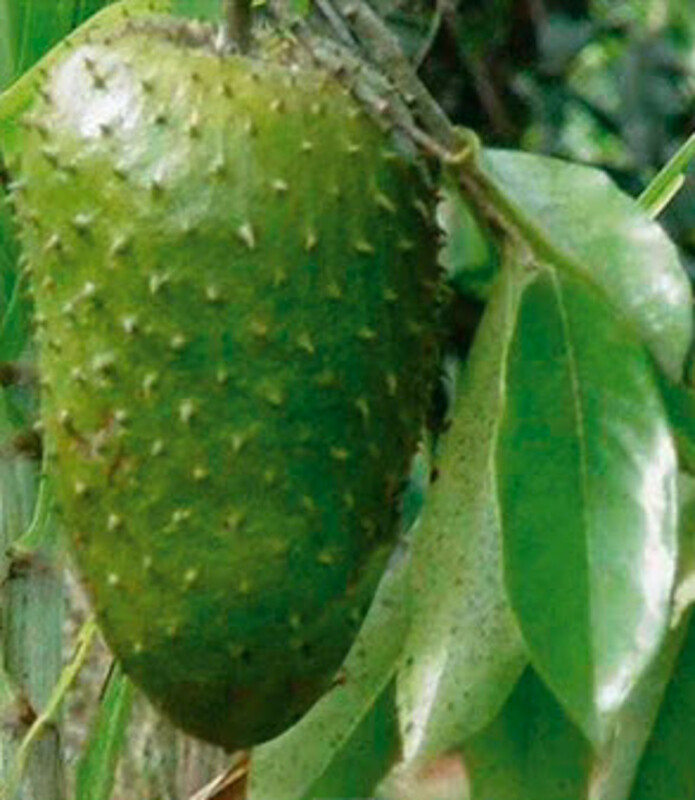 It is about this local herb that has cured many cancer patients. As I cautioned in my other articles on “alternative cancer cure”, this particular herbal treatment is no exception. It is not likely that one method or a single herb can cure everyone of cancer. Each individual is different and the condition of the disease is also different. 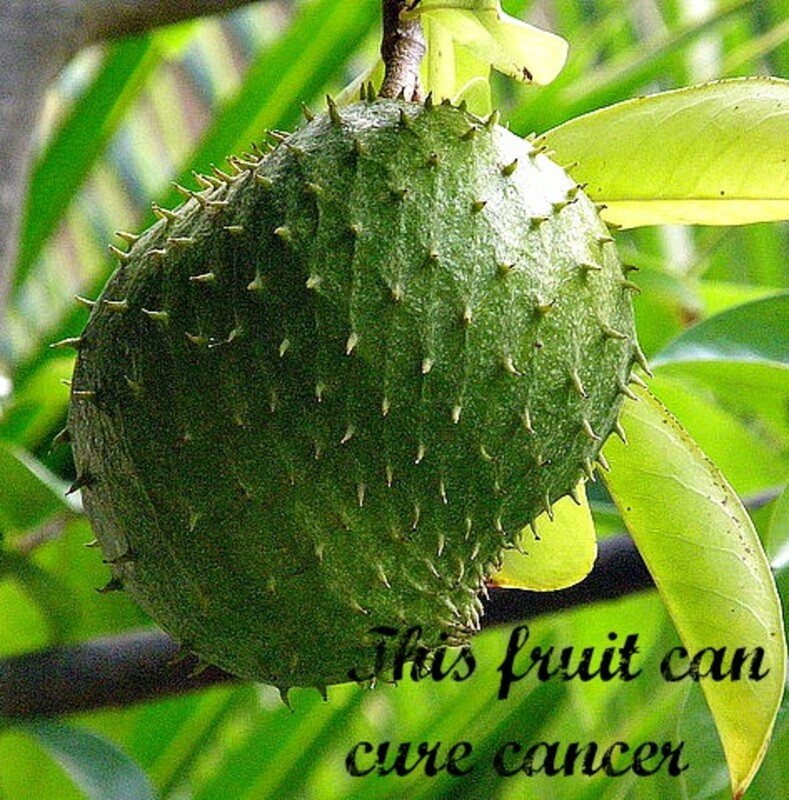 In this article, I merely like to share the information that some cancer patients have been successful in curing their sicknesses by using this herb. Who knows, someone reading this article may also benefit from this piece of information. The name of this herb is locally called in Malaysia as the "Sabah Snake Grass". Sabah is a state in Malaysia. Apparently the “scientific" name is Clinacanthus, or Clinathanus. But I don’t think it is, as I can’t find such terms in the internet. The Chinese name is Yu Xun Cao. There are also "local names" like Belalai Gajah and Gendis. But never mind; you can take a look at the photos on the right. This is the piece of information that might save lives. Who knows. So no harm sharing here. I shall give the links to the relevant sites at the end of this article. Others with high cholesterol, high blood pressure, high uric acid and diabetes have also benefitted from Sabah Snake Grass. A local newspaper reported that a 56-year old Mr Liu Lian Hui was confirmed having stage 4 lymphatic cancer in 2008, and was given only 3 months to live. Today (19 April 2011) he is still alive! He cured himself by drinking Sabah Snake Grass juice. He blended the Sabah Snake Grass leaves with green apples and drank the juice every morning after breakfast. Within 3 days 6 tumors disappeared, and after 13 days, he was cleared by the oncologist that he was 96% cured! Reduce dosage when condition improves. "The recommended dosage for SSG should not be more than 30 leaves, added with a slice of apple before blending. After blending, it is advisable to warm the SSG blend before drinking. " 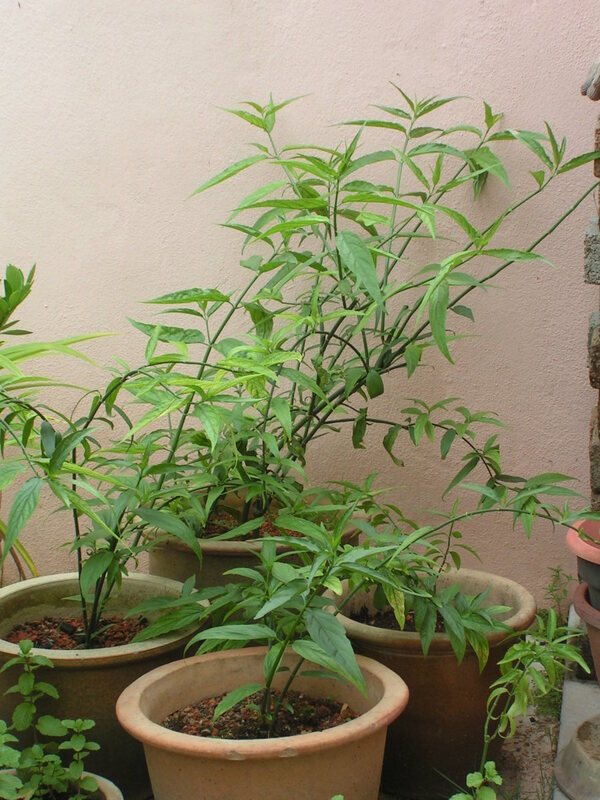 "It is best to grow about 50 plants for continuous supply of 150 leaves per day,plucking 3 leaves from each plant a day.That way the plant becomes less stressed.It prefers semi shade and grows profusely after 3 to 4 months of planting.Cancer patients can't wait for such a long period.So buy mature plants of a year old.Chemotherapy works for some people only and so is it with snake grass." Apparently there are two varieties of this plant. The effective one is the Sabah Snake Grass (SSG). The other variety is the Indian Snake Grass (ISG). The leaves of SSG taste sweet, whereas those of ISG taste very bitter. From my personal tasting, it is neither sweet nor bitter, but bland. 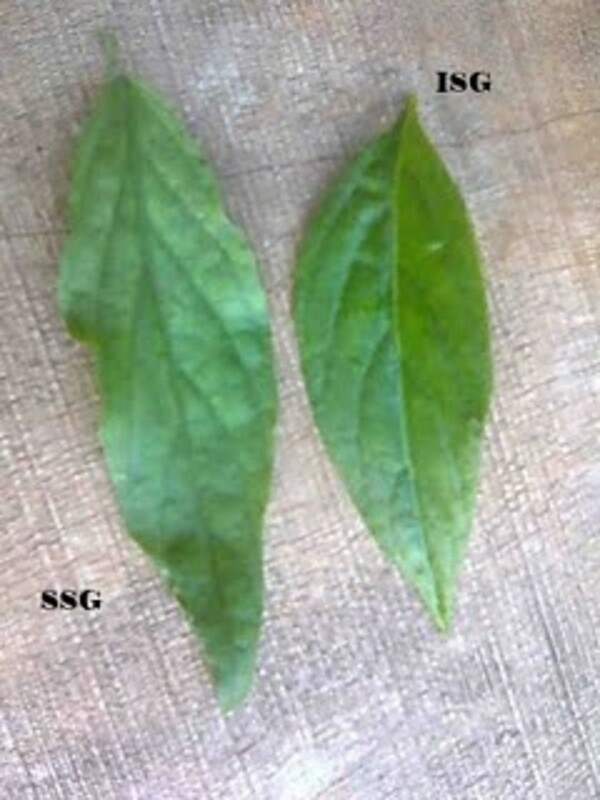 The leaves of SSG are longer than those of ISG. I have not seen ISG, so I really don't know. You can take a look at the photo on the right. This is going to be a big problem if you are not in my area. Apparently those living around my area can obtain the Sabah Snake Grass at the Penang Snake Temple, Ayer Itam Market, and Desa Rambai Market in BM. Usually I will have a few small plants available to give for free. For those in KL, I was told Sg. Buluh nursery is selling the Sabah Snake Grass. I hope in due course, readers may provide more information on this by putting their comments in the "comment" section at the end of this article. Some readers here may also have ample supply of this plant and may be generous enough to share with others within their areas. Please make known in the “comments” section for the benefits of all humankind. For those interested to obtain the plant for free within your area, please go through the comments section at the end of this article and I am sure in time to come, there will be others near you who are happy to share for free. There are also some commercial suppliers who commented. For testimonies from readers, please also read through the "comments" section at the end of this article. It is now my daily routine to pluck a few SSG leaves and chew them after my breakfast. 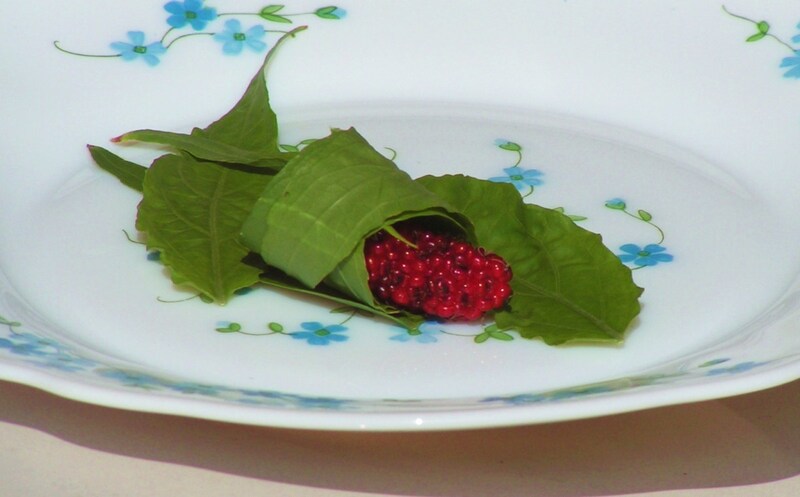 Whenever I am able to pluck the mulberries from my mulberry plant, I will wrap the mulberries with the SSG leaves and munch them. This is a healthy and delicious combination. Below is a short You Tube presentation of a kidney patient being cured by using a plant which I believe looks like the SSG. It was done on 30 April 2011. Incidentally, this video was shot in Pulau Betong, a remote village on the south-western part of my hometown, Penang Island, Malaysia. 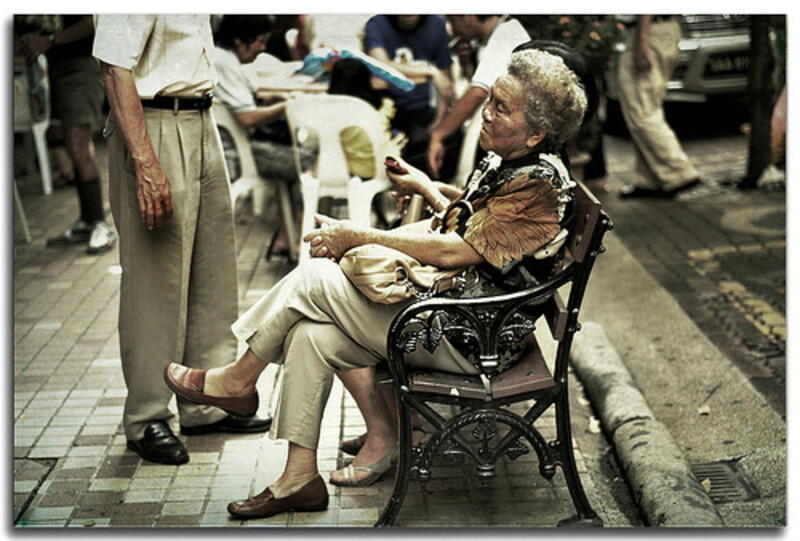 The dialogue is in typical Penang Hokkien, my local dialect. This man is Wong Teck Gee who had suffered from high blood pressure and kidney problem. He initially went to a private hospital (Lam Wah Ee Hospital) but after two years had to change to the government General Hospital which was very much cheaper. He was only given prescription for high blood pressure as he was told there was no drug that can cure his kidney problem. That went on for about another 6 years, and the kidney problem became more acute. He was inroduced to the plant by someone, which planted but initially did not use it, until when he was acutely sick and out of desperation, he tried the prescription. The initial reaction after consuming the concoction, was severe stomach pain and diarrhea. From that day onwards, he gradually became healthy, and gained weight as well. I note that there was no mention of cancer or the name of the plant. What I can deduce is that this man was very sick with kidney problem and was cured by this plant which looks like SSG. So this video is solely just a piece of visual presentation that someone has positive response after consuming the solution from the steamed leaves of the plant that resembles SSG. By the way, the method used by this man was a bit different. He steamed the leaves with 1 cup of water and 7 red dates for 4 hours; then drank it. I notice that the pot showed more than 7 dates. I assume that he now steams a larger portion, as he said he put in about 100 leaves each time. Take a look at the You Tube presentation below. May i know where can i get this SSG? My wife is down with lung, breast, lever and brain cancer. Can SSG cure her? Sorry you didnt give your location. As far as i know ssg is not sold commercially. Where i can buy this ssg plant? My mom is now at her stage 4 cancer of liver and colorectal? Please kindly reply. Hi! I am so interested with snake grass. How can i have this plant, I am 57 years old, a teacher from Zamboanga City, Philippines. I have maintenance medicine for my high blood, I’m taking too medicine for my uric? Hi I have the SSG plant in Penang. I used to provide it for a friend with cancer but since he no longer needs it, is anyone looking to replant or use the leaves do let me know. I usually prune the plants once a month. Hi friends. Would like to share again the effects off SSG. Had my colon assessed again and result was good, and CEA (cancer marker) showed result of 1.6 - the normal is 2.2 and below, I understand. I am in the second year after the operation. Hi..I'm from Penang and interested to plant the Sabah Snake Grass. Anyone can give me this plant for free? Thanks. Like to share something interesting about effect of using SNG. My PSA reading, marker for prostate cancer dropped slightly from 3.57 to 3.52 after taking SNG moderately, for about 3 months. Moderately, in my case, means 2x per week (thirty leaves). Although I don't have cancer of the prostate, I take it as a precaution-better than cure? Next, as I wrote earlier, I am still waiting for my cancer marker result (CEA) for colon cancer. I will share it (good or bad) when I get it in October. Hi everyone, im looking for pure sabah snake grass as well.I am staying in rawang.Where can i get those . And i do have a small doubt too .How many leaves should a stage 4 lung cancer patient should consume a day ?.Mr.good guy has mentioned ,150-200 leaves a day, whereas another person has told that should not consume more than 30 leaves. Just feeling confused .?? Can you enlighten me Mr.Good Guy/Mr Michael ? plssss!!!! help me I badly need to have this plant because I was diagnose that I have thyroid goiter that adapted cancer......I am here in philipines at #26 Blk.3 Lot.13 Gold st. Marieta Subd. Tibungco Davao City.I wanted to have extra long life that God gave me.....plssssssssssssssssssss!!!!!!!!!!!! Thanks for the quick reply. Like you, I am interested in sharing experiences more than anything else, especially when it comes to the disease of cancer where most of my family have. Appreciate your humility. Yes, I have recovered from my operation since about a year and a half ago, and now waiting for more tests and another scope to be done this year. Shall update all when I get the 'cancer marker' result. Meanwhile, I will take the leaves moderately until my next appointment in June. Cheers. Thanks for visiting, and I take it that you have recovered. Honestly I can't give you any advice as I am not qualified. I merely share info which I think is beneficial and helpful. I think there is no harm to take the drink in moderation. Best to consult a qualified herbalist. Thanks for sharing so much goodness to others. I have successfully grown the SSG and have started taking it a few weeks ago, about twice a week. I had a colon cancer (first stage) operation in 2013 and I am drinking it is as a preventive measure. But I don't know when I should stop or just continue as tea. Your advice is much appreciated. I was wondering that , At Sungai Buloh do they sell the Snake Grass ? Recently I read lots of article based on internet regarding Sabah Snake Grass, a website www.uncleherbs.org seems legit for me, any recommendation please guys ? I am Shadat from Bangladesh. I want to supply Mahogany seeds, Snake grass regular at reasonable price. where can i buy/find this sabah snake grass here in the Philippines? If anyone looking for SSG in Australia, message me.. laura_slimming@yahoo.com I'm in Perth, WA. Any where else in Australia can do postage. Cheers. Try the above exercise, reputed to heal all kinds of sickness. Since she is paralyzed , use visualization initially. I am sorry I don't know the answer. I am surprised that doctors can "deny" treating patients. Since this medicine worked for cancer, do you think it'll also work for a disease called CMT? My sister is diagnosed with CMT and is getting no treatment from doctors. They used to live in Utah for 1 year until she was injured at work and that's when the disease came out. The doctors in Utah denied her. Her work place said that it wasn't their fault. So they came back to California. She can't work. Paralyzed and hurting really bad. Still no cure yet. So please help me. Painkillers not doing any thing either. Note: Untuk belian borong teh, daun kering dan daun btg kering, sila contact saya personally for detail quotation. The article above about side effects of SSG is as good as rubbish ! One comment mentioning about taking 5 sachets of SSG teabag daily for 3 days and experienced severe joint pains, who asked him to take SO MUCH teabag in a day in the first place ??? One sachets per day is the recommended qty for the body since it has cooling effect, unless he is a stage 4 cancer patient and time is running out for him, in which case 2-3 sachets per day maybe ok, even then the patient may need to drink some ginger water to counter the cooling effect. Two sides of a coin! Please check this out also for side effects! Are there any suppliers in Singapore? Hello I would like to get a plant. How would I go about that in the US? hi good guy can you help me,how many ssg leaves to make juice for fibroid.Thank you. Thanks. The reason I am enquiring because I live in UK and hoping to obtain some seeds to germinate them. Never seen any flowers. I don't know. Does the SSG produces seeds? I grow SSG in my garden. 1. 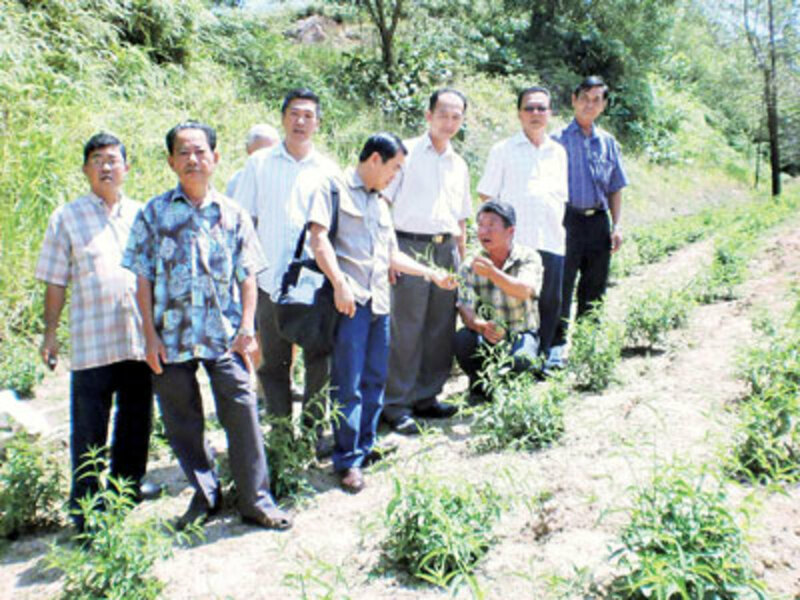 How to consume the sabah snake grass according to the stage for kidney failure? 2. Any idea where to get this sabah snake grass in taiping? Good blog and well written. 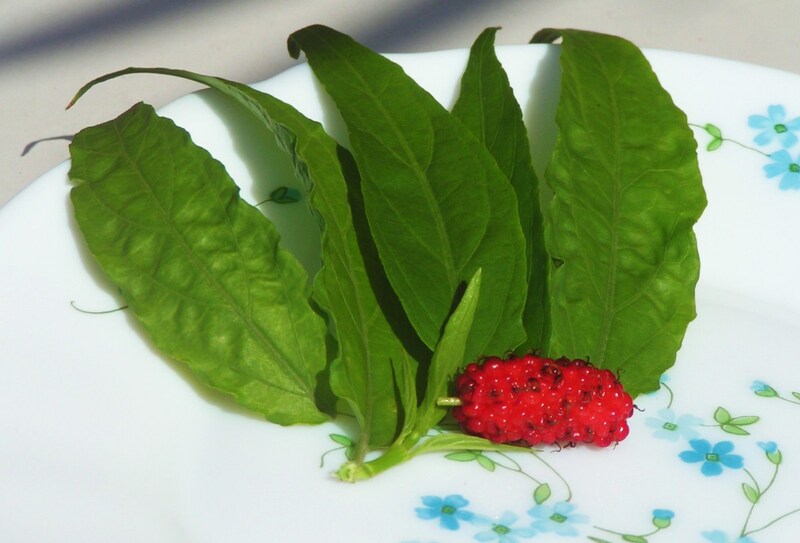 Very little is known about this herb outside of SE Asia and it is good for someone to write more about it so that more people are aware of this alternative or additional supplement in cancer treatment. Do take note that many people writing in here are lay people with very little scientific knowledge. Some may be even contributing wrong information. For example, you mention about the Indian Snake Grass and someone said it is hempedu bumi. Hempedu bumi is actually Andrographis paniculata which is a different plant altogether. 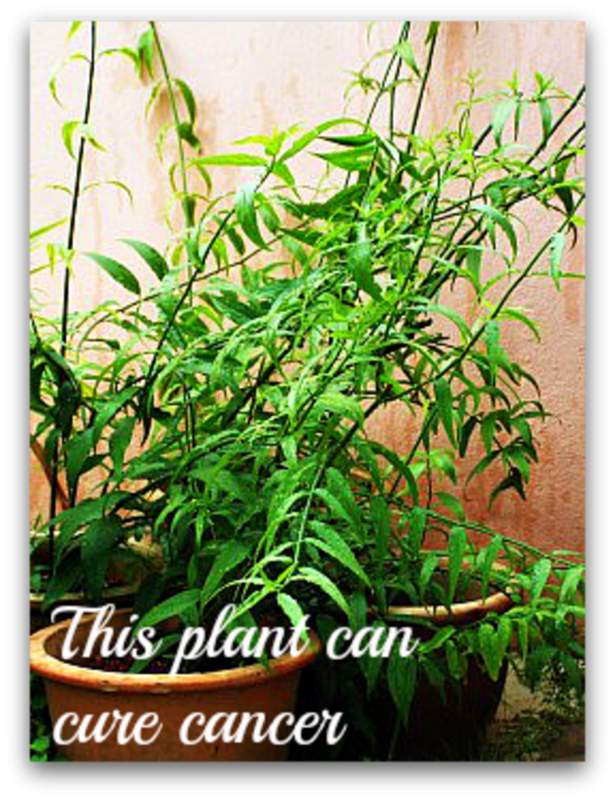 Hempedu bumi is effective in treating a few ailments but it may not be effective for cancer. Again, people reading this blog should be aware that some advice from people should be checked. As a physician I am aware that medical research requires a lot of funding. Herbal remedies often do not receive commercial funding because it is very difficult to patent your discovery for a natural substance. Hence, you often do not find adequate research studies on medicinal herbs. I believe some may be effective but some may be useless or even harmful. I would advice that if your cancer is still at a treatable stage , please seek proven treatment as soon as possible. SSG may not have interactions with chemotherapeutic agents and it is worth a try while you go for your cancer treatment. 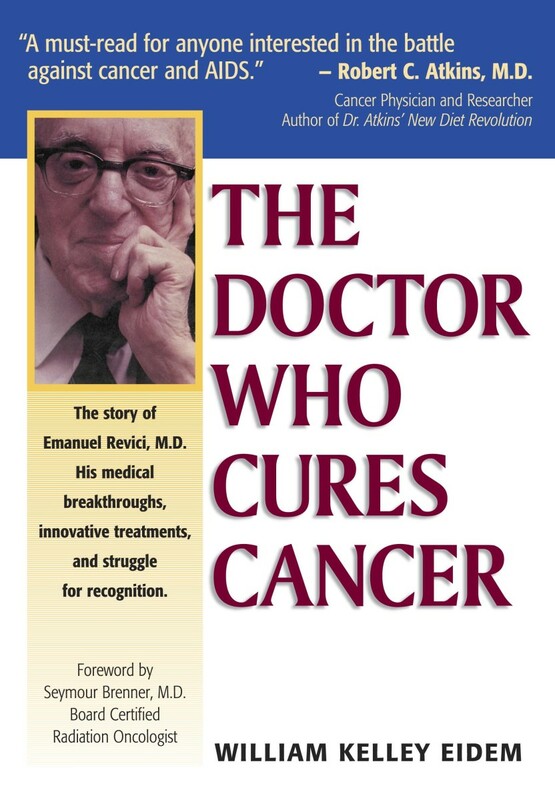 For those who are diagnosed with late stage cancers, unfortunately I have to say that this is the limitation of modern medicine at this moment. If you have nothing to lose, you should give alternative treatment a try while you have your oncologic treatment. However, beware of those who are out to take advantage of your desperate situation. I am glad that this herb can be taken as it is, you can plant it on your own, so there is less opportunity for people to sell you fake products. I am glad to see people genuinely providing plants and sample to help others. I know too little about the pharmacology of SSG. Some studies have been done to show that it does have anti proliferative action on cancer cell lines. It would be great that some actual clinical trials can be done at some stage. Just bought an SSG extract liquid online from this company for my mother who suffering from colon cancer. My mom needs to take a lot of fresh ssg leaves and can't wait ssg to grow. Check out their testimonials section too. Alhamdulillah! Saya bisa kurir anda dengan sabah snake grass yang anda cari. Ada 3 jenis SSG yaitu daun segar, teh celup dan kapsul. Silah kunjungi blog saya untuk informasi lebih lanjut: www.savelifenow.blogspot.com dan sila email saya jika anda berminat. I urgently need the Mr LIU's number or email id or anyone's contact who has been cured of lung cancer by consuming tge snake grass. 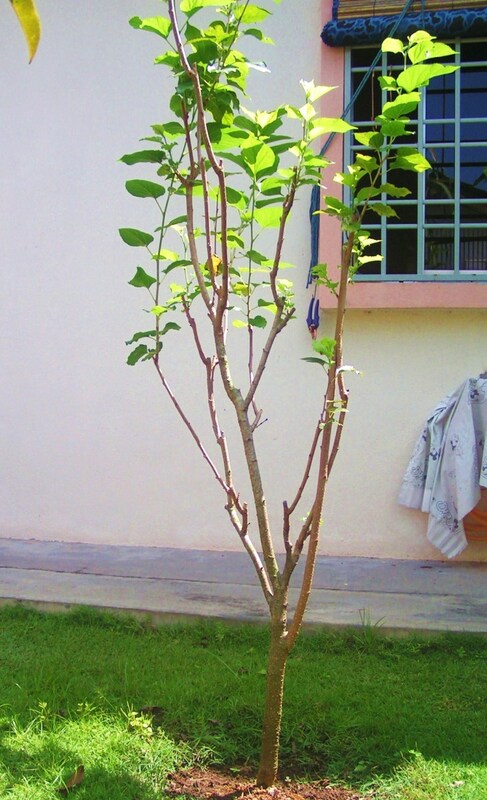 Hi,I live in Ipoh.A friend down with lymphoma asked my help in planting the SSG for him as his garden is too small.I believe the SSG has played a great part in his remission.Now the bush is very big and I need to trim it regularly.Anyone who would like to plant it can contact me at dicksonsundaram@gmail.com.Hey,it is for free man. I would like to know about this SSG & ISG. I am from India & one of my sister is at stage4 Esophagal cancer. Can anyone tell me whether we can use Indian Snake grass for treating this cancer. OR where & how can I get SSG as to start treatment immediately. Please help me & God will help you. Scan through the comments and find the commercial suppliers. This is a better bet. Where can I get this herb in Penang? At the air itam market? Is there anywhere else that is abundant. I need it for my mum's lung cancer stage 4. I come across a florist stall in Toa Payoh Lor 8 market selling SSG.U may want to check it up. Hope u can find it. Kesavan, you can buy Sabah snake grass from Ayer Itam wet market in the morning. If you search around even in your area, you would most likely find one, infront of someone's compound. Just ask for a short cutting, poke it into the pot or ground, and it will grow. It's a weed. My brother in law has been diagnosed with stage 3 liver cancer. We live in Tanjung Bungah. Where's the nearest place to get the SSG leaves. We would like to get some plants too. Is it possible to grow them from seeds? I heard that it's also grown near The Pagoda. Can anyone confirm this? I just like to know where can I buy this plant in Petaling Jaya. Is there any nursery selling it? Hi! Where can I get this herbs from Singapore? Great Blog!! Herbal Ayurvedic Herbs are really good for health. Your thought processing is wonderful. The way you tell the thing is awesome. Mr Good Guy! Ur good deed will be blessing! My father had diagnosed 4th stage of lung cancer n had been metastat to brain. It's been two mth fr now. Im so sad that I found out that most western medical, I mean those oncologists are more concern of $$ rather than the patient. One day if I'm more free I will create a blog like u to save n give sharing to those who needed. To cut it short I'm now given my dad to practice TCM alone n I found it really works to him. I'm glad I found the greatest Tcm doc, my opinion. I go through all this post and comments n I realize many is suffering of cough n etc. FYI the first week my father ongoing his chinese medicine he's in terrible cough n vomitting till I send him to hospital. I'm glad I had faith to let him continue till now he healthier n no more cough now. However, bout last week he started to behave imbalance while walking again. My good friend intro SSG to me. After 3 days taken I can see a lots improvement n I can see her face aura is better ever. I would like to give advice to anyone out there which ever they consume traditional medicine, I found out there will be diarhere or vomit, I think is natural n some sort of detoxication. Pls warn that it's base on my own opinion n I'm not such a medicator. Final n not least I hope my father at least hv 3 to 5 yrs life to go which oncologists estimate he got another 3 to 6 mths life span. Also I hope my dad going without suffering. P/s: I hope all u guys out there who suffering this cruel disease may found ur most suitable potion which suit u n recover. Those who takes the opportunity to grab profit here pls be compasion but not only $$$. Life is happier when u do good deed!! I'm in the Singapore area, any idea where I can get the SSG plant? We grow this plant (SSG) in our farm in Gapan City, Nueva Ecija, Philippines. If anyone who suffer from serious ailments please contact us thru my email address: nori_tanglad@yahoo.com. I hava been trying to locate the YPL Herbal Farm in Johor. Until today I am still trying to locate it. Can u help me. I am suffering from prostat cancer which is at stage 4. I am in Qatar from Pakistan. Where can I find this in Qatar or Pakistan. My father has Lymphoma. I want this grass for his treatment. Hi Justin, I came to know about SSG and its wonderful effect from my patient who has cancer. He is recovering well. I do constitutional prescribing for my patients and can very well understand that not everyone can benefit from SSG. But to these people, don't be discouraged. Instead, seek other cures from your own land/soil. There is always something for everyone, we have to make the effort to find that out for ourselves, and yes, sometime, time is not on our side. Even though this wonderful plant may help people with cancer, don't forget life's basic principles - exercise, watch what you eat and eat in moderation, enjoy healthy hobbies and get proper sleep. I know some people from different regions are trying to grow SSG. I think planters need to know that local plants may not suit other region's climate and soil. It's just the way it is. There may be some instances of successes though but you will notice the size or character or even effects of the leaves may slightly differ due to soil conditions. I hope those who have received SSG plants for free will continue to help others in return and not for greed. If you have recovered or recovering from cancer or other terminal illness and you have benefited from SSG, make your life useful and meaningful to others in return. If you cannot plant SSG, you may like to sponsor a plant in some religious grounds or something like that to help those who need them. Even one or two plants that you leave in the wild to grow freely can help others in time to come. Otherwise, just let others know about SSG. It is a blessing to be able to help others with little or no returns. I am an undergraduate student studying in Kota Kinabalu, Sabah. Seeing the usefulness of SSG as a local herbs, I'm planning to conduct a product development out of its use. Anyone could guide me to the availability of this SSG as I'm not a local here in Sabah. Very much appreciate that, thankyou. There are so many comments here. Maybe if you go through them, you may find one who is near you. Or you may contact the commercial suppliers who have made comments here. Can i ask where i can get SSG to plant here in the philippines,or have already here in the philippines? because my sister inlaw have breast cancer and i like to help her.. Thanks for sharing, how do u make the potion of sabah snake grass, why is it being applied on face, and not eaten. What is herpe? We just found out that Sabah Snake Grass in Thai "Salay Pong Pon" is very effective in treating Herpes. A Friend of ours came down with Herpes she went to hospital received some Creams but they did not bring much relief. She found out that we have Sabah Snake grass in our Garden, Siwalai made a potion of it and after using overnight on her Face our Friend Herpes had immensely improved. Being that Herpes is a Virus it can be assumed that it will work for other Viruses as well. Please search through the comments to find the suppliers. I was just shown your article and I'm really impressed by what this plant can do to cure cancer patients as I have a few in my family. I have stayed in Malaysia for more than three years but unfortunately during my stay i never came across any information about this plant. I am a Nigerian and I'm sure you know I live a million miles away. I just want to ask you how I can get this plant, do I have to come to Kl. to get it or can it be sent via courier service? I would also like to know whether you have any seeds of the plant that I can bring back to my country as there are so many patients here and would like to help them with it too. I would like to have your phone number if possible so that I would call you and we can discuss about it more because as I said I have an aunt and a brother in law who have cancer and would like to offer them this plant to help them. Thank you. Hi, I've just derooted a big bunch of SSG from my garden. Instead of throwing it away, anyone interested to have them and the leaves can contact me. Will need to collect from my place in Petaling Jaya ideally by tomorrow morning. I'm residing near University Hospital, section 11. kindly text me if interested 0162430049. SSG is easy to plant, cut the stem and push it into the pot or ground, water it daily and it will start shooting. Method is similar to planting "Sayur Manis"
Please tell me where can I get "horse grass" or ma chao in mandarin? I have another question, can SSG be consumed daily with Maitake Mushroom Extract? My relatives bought this extract and I was wondering if it would interfere with the effects of SSG if used together (but taken at a different time of the day). I'm here to help. It looks like the free supply for SSG is never enough to satisfy the demand. There is a commercial supplier that grow many acres of SSG that supply fresh and dried leaves and even in pure SSG tea. Hope this helps. God bless everyone and your love ones. Please go through the comments section. You may find commercial suppliers there. I am from Penang island and I need a supply of 300 SSG leaves a day for my father's stage 4 pancreatic cancer. Do you know where exactly can I find SSG leaves in Air Itam Market or any contacts of supplier in Penang? It would be helpful if someone from Penang could offer me this plant as I would like to grow it in my home as well. My email is happyhorsy@yahoo.com. Thanks. Where can i get the SSG? I would like to grow it in my garden. Im having pains on my shoulder and back. Do i have to lessen my dosage? Im taking 150 only for 7 days. Your assistance will be very much appreciated .